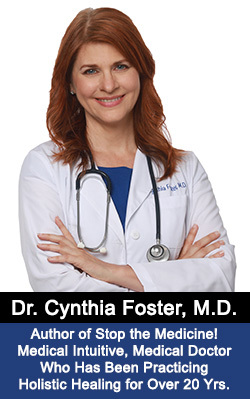 by Dr. Cynthia Foster, M.D. How can I check my order status/track my package? Does Dr. Foster do consultations? How do I make an appointment? I have a specific health problem. What do I take for it? What herb can I substitute for my medication? How do I know which herbs I need? How long will each bottle of herbs last? Do you have a Colon cleanse?, Liver cleanse, Kidney cleanse, Parasite cleanse, Candida cleanse, Weight Loss Program, Cholesterol Cleanse, Natural Fertility Program, Prenatal Program, Postnatal Program? Why don't you sell vitamins? Why are the liquid herbal tinctures preserved in alcohol? What can I do if I'm sensitive to alcohol? My liquid formula looks cloudy. Is there something wrong with it? My formula looks/smells/tastes different from the last time I bought it. Is this normal? Resin has collected around the neck of my myrrh bottle. Is this normal? Can I do a cleanse while I'm on medication? Will it interact? Can I take these herbs with my vitamins? How many herbs/formulas can I take at the same time? What do I eat during an herbal cleanse/ program? How long does it take before the herbs work? I did a cleanse and I'm not cured yet. What did I do wrong? How do I know when to stop herbs and give up? I was "muscle tested" for your herbs and I tested weak. Why? I had a reaction to one of your products. Was it a side effect, allergic reaction or healing reaction? What should I do? I feel a "rush" when I take these herbs. Is this normal? I'm taking birth control pills. Will herbs interfere with their effectiveness? How much time do I wait in between cleanses? Must I always dilute essential oils before applying them? What is the shelf life of these herbal supplements? Do I need to refrigerate/store my herbs in a special way? Babies, Children & Teenagers - Can They Take Herbs? Is my teenager with a hormonal imbalance too young to take herbs to help regulate her menstrual cycle? What herbs should I take/not take during pregnancy? Can I take herbs while breastfeeding? How do I do a juice fast? Is that Reiki Tummo Testimonial for real? Does Dr. Foster do consultations? Could I make an appointment? Yes. Dr. Foster is doing telephone and Skype consultations. I have a specific health problem. What do I take? The Ailment Reference Guide is no longer available because the FDA tells me that my products are not generally recognized as safe and effective to diagnose, treat, cure or prevent any disease. Claiming that herbs can do this causes them to be classified as a "new drug" under section 201(p) of the Federal Food, Drug and Cosmetic Act [21 U.S.C. § 321(p)] The FDA approves a new drug on the basis of scientific data submitted by a drug sponsor to demonstrate the the drug is safe and effective. I am not a drug sponsor. I would never want to be a drug sponsor. To be a drug sponsor, I would have to change the constituents of an herb (as around 40% of all pharmaceuticals originated from herbs anyway), by applying synthetic chemical groups to it to make it unique (which could alter its healing benefits and render it carcinogenic, or basically hepatotoxic, nephrotoxic or neurotoxic), then spend thousands of dollars getting it patented and doing research studies on it to make sure that it's safe because I added synthetic chemical groups on it to get the patent - something that has never before existed in nature and the long term effects would be unknown until at least 2 generations after I administered it (to account for the children that could possibly be born with birth defects due to the synthetic drug I gave to the parent). Then, after I proved this chemical combination was safe with the bare minimum of testing, I could charge a thousand dollars a month for the drug and rake in the millions for it, and spend a considerable amount of that money hiring lobbyists to go to Washington DC (as most of the major pharmaceutical companies do) and contribute millions of dollars to political candidates to influence the law-making process to ensure that everyone had the right to continue doing what I did with synthetic chemicals - price gouging the public, pretending to do them a service, giving them a chemical that gives a short term result while sometimes damaging their liver and kidneys, causing unbearable side effects, and probably giving them cancer. And all of that to make the big bucks when all that was needed were fairly inexpensive herbs and the knowledge of how to use them. I'm not interested in getting rich this way by hurting innocent people! I don't mind living a simple life. I took the Hippocratic Oath and swore to do no harm, so, with all due respect, no thank you to the drug sponsor thing. The Ailment Reference Guide was an alphabetical list of over 400 health issues that specified exactly what formulas to take. It was a FREE REFERENCE - This guide was very specific and specified exactly what to take for everything from anemia to strep throat to bronchitis to swollen lymph nodes to heavy metal poisoning to various types of tumors. It even included an herbal support program to lessen side effects and increase energy levels while undergoing cancer chemotherapy. All of this is illegal, and, so course, it had to be removed from this website. You may be able to pick up some tips from this Herbal Reference Guide on a third party website. Please use our online questionnaire to determine which formulas are most appropriate for your particular circumstances. (Click Here for the Herbal Questionnaire) Based on your age, gender, symptoms, current medications, and lab tests, this test tells you exactly which formulas will be the most helpful. The Ailment Reference Guide and online questionnaire were designed to help people understand natural therapies, their own bodies and how to heal themselves so that they can lessen their dependence on the conventional medical system. With the right information, people can do natural therapies easily and in the comfort of their own homes. Read through the terms and conditions and if you agree with these terms and conditions, click on the link at the bottom to agree. This takes you to the Discussion Board. Although you are not signed in yet, you can still read everyone's posts. At the top of the page are two statements. Click the links at the top of the page to either sign in or sign up to become a member. If you are not signed up as a member yet, you will be taken to a very simple page to ask for a username, password and email address. That's it! Now, just wait for the verification email to come to your email address, click the link in this email to verify your email address and you're done. You should now be able to sign into the Discussion Board and post questions. 2. You didn't receive or you didn't click on the email sent to you to verify your email address. Most common reason for not receiving your verification email: you made a typo in your email address. Please check this very carefully! 2nd most common reason: your email program filtered it out. Instructions for setting up cookies on Firefox and Internet Explorer Internet browsers are below. Please keep in mind that browser versions vary, so these instructions might not be the exact steps you need to take for your personal setup. If this does not give you the answers you need, please refer to the help information available on your menu bar. 1. Open your Internet browser. 2. Select “Tools” from the menu bar. 4. Click on the “Privacy” icon. 5. Under the “Cookie” section, ensure that both boxes for accepting cookies are selected. 4. Click on the “Privacy” tab. 5. Ensure that the settings are set to medium-high or lower. If you did not receive an email to verify your email address, you may have incorrectly typed in your email address or the email may have been filtered out by your email filters. Please change your email filters to allow emails from drfostersessentials.com. If you did not receive an email, please click here to email us, and we will email you to verify your email address. Hit reply to that email to let us know that you're a real person. Once we have received your email back, we can activate your registration for the Discussion Board. Once you have been registered, and as long as you have cookies enabled, you should be able to sign in and post questions. Herbs may have an immediate effect that relieves symptoms. For example, someone taking Germ Blaster within the first 24 hours of a cold can have the cold go away within 24 hours. Or, itching can go away within seconds of applying Tea Tree/Jojoba oil blend; a sore throat can be eased within seconds of consuming a gargle with Clove oil. Heartburn can almost instantly be soothed with Colon Soothe. A heart attack or stroke can sometimes be averted within minutes with a large dose of Cayenne Tincture. However, the way they work is vastly different from the way prescription or chemical medications work. Unlike medications, herbs do not force the body to do something it's not ready to do. Therefore, the initial effect may or may not be weaker than medications. For example, a person with high blood pressure can have a great effect from an herbal formula designed to lower blood pressure, yet, the underlying causes (atherosclerosis, lack of circulation to the kidneys, kidney toxins) are not going to be eliminated with just one dose (and people may need to change the foods they eat, cleanse their liver and take Youthful Circulation for several months to get the cholesterol deposits cleaned out of their arteries. They may need blood thinning herbs and supplements for life if they continue to eat a diet consisting of processed foods). The difference is that while prescription blood pressure meds must be taken every day for life, herbs and healthy lifestyle are gradually removing the underlying causes so that after the toxins have been removed, no blood pressure lowering herbs are needed. There is more work involved up front, but the payoff in the long term is enormous. With the astronomical prices of prescription drugs that continue to increase, anything that saves a person from having to take a prescription drug over their entire lifespan can amount to a significant savings. The long term effect is usually much stronger and more permanent than the short term effect. After the heart attack is stopped with cayenne, there is herbal healing to be done on the heart with heart building herbs, colon toxins, and liver/cholesterol issues. After the itching goes away, we must determine what caused the rash. (Usually toxins in the blood, allergies and/or low immune system). Although the heartburn went away, it can come back if we don't get to some of the real causes (e.g. constipation: less than 3 bowel movements per day), which causes a backup of waste into the stomach and esophagus - otherwise known as "reflux". Many people give up herbs after just a few days when they should be taking them for at least 3 months in order to see a long term and noticeable healing effect. They move on to a different herb before the herb has had a chance to work. Unlike synthetic medications, herbs contain high amounts of vitamins, minerals, trace minerals, antioxidants, enzymes and other botanical components that are required by the body in order to heal. They are recognized as food by the body and are generally much better tolerated than chemical medicines. Unlike medications, we very rarely see toxic side effects from taking herbs. It takes time, nutrients, exercise, rest and a positive attitude to heal. There is only so fast that diseased cells can be replaced by healthy cells. When enough diseased cells have been replaced by healthy cells, people see dramatic improvements in health. Then, many people end up not needing their prescription medications anymore. For babies and children, the healing happens quickly. They have a great deal of "vital force," not so many toxins accumulated in their tissues, and few emotional issues. On the other hand, an elderly person can take much longer to heal due to a lower "vital force" (dwindles with aging), low hormonal strength, more accumulated toxins in the body and more emotional issues. People in their 20's and 30's typically heal faster than people in their 70's and 80's. And a person with an acute health issue always heals faster than a person with a chronic problem. And lastly, a person who implements healthy lifestyle habits such as drinking water, exercising, avoiding tobacco and excessive drinking are going to heal faster than people who eat fast food and never exercise or try to heal their emotions. You didn't do anything wrong! For many chronic health issues, it can take more than one cleanse to remedy the problem. The longer a disease has existed in the body, the longer it can take to reverse it. The body can only eliminate toxins so fast. Anyone or any company who claims to be able to get rid of all of the toxins in the body in one week is simply lying. Depending on how severe the health problem is, it can take months to do this. Healing sometimes occurs in unexpected ways. You may have been trying to heal your prostate cancer with herbs, but the first thing that happened was that your high blood pressure went down to the normal range. The body has priorities that may be different from what we think they should be. It may have been necessary for the body to heal the blood pressure first before it could begin healing the prostate. In healing migraines, the migraines may take a while to go away, but the digestion problems typically clear up first because they are a higher priority. If something positive happens during or after a cleanse, but it was not what you expected, it is a good sign that the body will continue to heal during further herbal cleanses. Eventually the body strengthens to such a point that it can finally address the worse and deepest health issue. 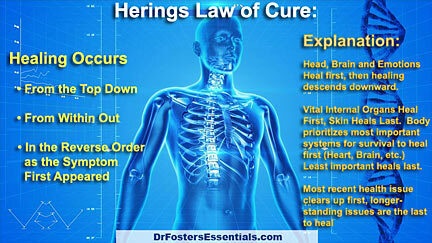 Hering's Law of the Cure states that healing occurs from the head down, from the inside out and in the opposite order as the symptoms first appeared. This law only applies to people who are using pure natural methods (such as herbs, energy healing, homeopathy, etc.) to heal themselves. This law does not apply to anyone who is trying to heal themselves with chemical medications (prescription or over the counter). Chemical medications quiet the symptoms while pushing the disease further down into the body tissues, forcing a person into a deeper stage of disease that will require more and more medical interventions over the years. I highly recommend reading the Newsletter (click here to see it) about the Four Stages of Disease, learn what is at the root of many health problems, and how to reverse a health issue. There is a tendency to believe that if herbal therapy does not work immediately then it will not work at all. This is absolutely false. People assume this is true because this is the way prescription medications work. HERBS ARE NOT THE SAME AS PRESCRIPTION MEDICATIONS. It can take at least 3 months in order to see dramatic improvements. Usually the problem is that the ill person is not taking enough herbs or is trying to substitute a single herb for a medication without considering how to heal the whole body. They may be taking weak herbal formulas such as powdered herbs in capsules or weak, watered down liquid herbal extracts. Some people believe that herbs can compensate for a bad diet or very stressful lifestyle. Herbs can do this to a certain extent; however, when the illness is serious, not only should herbs be taken, but diet and lifestyle should also be changed or else healing may not occur. It takes time for the body to rebuild. Unlike herbs, regular medications do not contain anything nutritional and cannot rebuild body cells. Prescription medications typically have a strong initial effect that relieves symptoms. The effects of herbs are typically not so dramatic up front, but over the long term, they rebuild and regenerate the body with many naturally-occurring vitamins/minerals/trace minerals and other nutrients. It takes time for the body to rebuild. Most people simply need to be more patient and to stay on one program for longer than 3 weeks before jumping over to another healing program. "Natural healer hopping" can cause more delays in healing than if one simply stayed on a single health program. Of course my philosophy is, "Never give up!" How many products to take depends on the individual. For people who have never taken herbs before, we recommend to start with one cleansing program (for example: Liver Regeneration Program, Parasite Cleanse Kit, Intestinal Rejuvenation Program, Candida Program, Weight Loss Program, Beginner's Program, Cholesterol Busters Program, Natural Fertility Program, Hormone Balancing Program, Juice Fasting Program, Prenatal Program, or Postnatal/Nursing Program) or just a few products individually. If there are several health issues to work on, it is important to decide which health issue is the most pressing and deal with that one first. After taking a few products and doing a cleansing program, it will be possible to add more products to deal with other health issues if needed. Sometimes a cleansing program takes care of a few of the specific issues anyway since cleansing the elimination organs (colon/intestines, liver, kidneys) in the body can help specific health issues. Ironically, these are usually the issues that many people think are not related to their elimination organs. Yet, they are! Some people fear taking more than one herbal product at a time. I need to reassure people that herbs are not prescription medications. They are not drugs, and, of course, I am not a drug sponsor. They do not have as many interactions or side effects as prescription or synthetic medications have. Many of these fears come from having reactions to prescription medications. The American medical profession tend to think of herbs like medications. Therefore, they assume that because medications are dangerous, then herbs must be dangerous, too. And this is hilarious considering the fact that medical doctors receive absolutely zero hours of training in herbs, and trained herbalists usually have at least 3 to 4 years of training. The good news is the body knows what to do with herbs. It knows what to do with many herbs at the same time without interacting. The most common herbal interaction is not an interaction at all. It is simply a toxin release caused by taking too much too soon. If one took a stimulant and a depressant at the same time, it might possibly defeat the purpose of each. The important thing to remember is to start slow with herbs and add on gradually if needed. When I had a concussion last year, I took stimulant herbs (for the brain) and sedative herbs (for the heart) at the same time, and nothing bad happened, so sometimes even I am surprised at how well the body accepts herbs. I've taken up to 8 formulas in the same dose and nothing exploded. We were created in harmony with nature, so we shouldn't be surprised that our body is in harmony with herbs. When I visited Peru, I was in contact with some herbal healers who told me that the natives living in the Peruvian rainforest regularly take a brew of around 100 herbs. He noted that the natives were never ill, but if they decided to leave the rainforest and adopt a more civilized lifestyle, they sometimes developed diseases. If there is a severe health challenge, the game is a bit different. In this case, people start with the 28-Day Healing Program and sometimes a specific formula specific to the issue can be added to this. They start here because their situation demands it. They don't have any time to wait, so they need to cleanse at full speed in order to save their life. In a word, yes. Interactions between herbs and vitamins are very very rare. So, it's ok to take Vitamin C with your echinacea. You can take your Calcium From Herbs with your flax oil. You can take Essential Nutrients with your amino acids. You can take L-tyrosine and Vitamin E with Female Magnetism. You can take Peaceful Nerves with melatonin. You can take your colostrum with our Flora-G Plus. You can take l-lysine with our AntiViral Formula and AntiViral oil. From my clinical experience, I've seen herbs work better than vitamins, so I think sometimes people overspend on vitamins when they could be spending it better on something more effective, but if people really need to keep taking their vitamins, then it's ok. I've had many patients. Some I never could convince to give up their vitamins. Years later, they're probably still taking their vitamins with my herbs. Exceptions: please keep a careful watch on your supplements for stimulants. Sometimes natural "energy" drinks contains lots of stimulants such as guarana, caffeine, kola nut, yohimbe, etc. Although they are natural, they can still cause rapid heartbeat. Even ginseng or ginseng-like herbs can have a stimulant effect on the heart, even though they do not contain caffeine. So, if you are taking any stimulants, natural or otherwise, use a lot of caution using any other herbs that are stimulants (Nerve Revive, Male Magnetism, Female Magnetism, Adrenal Support). Please not that some vitamins can irritate the bladder, urethra and prostate. This is particularly true with Vitamin C. After I had clients discontinue their vitamins, many of their mysterious symptoms went away. Note to vegans: Taking Vitamin B 12 is mandatory. Most vegans who do not supplement with B12 are deficient. B12 deficiency can cause permanent neurological damage, including numbness and tingling in the fingers and toes, slurred speech, depression, forgetfulness and pernicious anemia. I went to another natural health practitioner and was muscle tested with your herbs and I tested weak. Why? I have a lot of experience with kinesiology and "muscle testing." I've been to several practitioners who each got different results given the same problem. Kinesiology is notoriously inaccurate. The subconscious attitudes (and even the desire to have you as their patient) can interfere with the muscle testing. Some practitioners are aware of the problems with muscle testing, so they try various techniques to overcome the problems with their own mind interfering. They go through various gestures, tap the top of your head, put your palms up, put your palms down, etc. etc. etc. It can become quite the "crazy dance" waiting for them to get to the place where they claim they're "clear" and "the results are accurate now." One of the reasons why I don't use kinesiology in my practice is because of all the problems I've seen with practitioners who are supposedly good at this. I've had some practitioners tell my patients my formulas were too strong for them and that they tested weak for them. I put them on the cleanse anyway, and they did absolutely fine. You're not going to explode if you do something that "muscle tests" weak. And I have plenty of stories of people who took my herbs in to a practitioner who tested them on a vibrational machine and they tested "off the charts amazing." Obviously, muscle testing can get you results that are completely inconsistent with other tests as well as other practitioners. Not only do we have problems with the subconscious mind of the tester interfering with the results, we can have problems with the subconscious mind of the person being tested. So, your OWN subconscious mind and your fear of getting well can actually give you a negative result or "weak" reading. I've seen it time and time again where someone had a subconscious sabotage pattern running in their subconscious mind. There are ways of tapping into that issue and resolving it, but one very simple way is to simply overcome the fear of trying things on your own and thinking you have to always follow directions from an expert. Chances are if your intuition led you to an herbal product, it was something important. Don't doubt your hunches or gut feelings, even if some expert gives you a fancy lab test, hair analysis, urine test, saliva test, or muscle testing session. Trust yourself. If it doesn't seem right to you on a gut level, always go with your gut. I had a reaction to an herbal product. Was it a healing reaction, side effect or allergic reaction? There are several reasons why people can sometimes not feel well when taking herbs. It can sometimes be a coincidence or it could be a detoxification (healing crisis) occurring. We want to let you know that we care what happens to our customers when they take our herbs and we are very interested in assisting them in regaining their health. Please keep reading because I'm going to list the most common reasons why people have a reaction, but if you need help right away, please email us or leave us a message on our toll-free number line 888-294-3804. They will contact us and let us know you have a problem. It will help if you let us know your age, gender, symptoms, any medical diagnoses you've ever had (even if the doctor said you were cured of it), what prescription and over the counter medications you are currently taking, what herbs you took in what dose, and then what happened. We will help you figure out what to do. In some cases, it's simply a matter of lowering the dose of the formula you're taking. In other cases, we can provide a quick natural fix with common things you may already have in your kitchen or bathroom, so it's worthwhile to contact us. Please read below for more extensive information. Dizziness, especially when standing up - this is often caused by taking prescription blood pressure medication. It could also happen if you're dehydrated, or POTS Syndrome - a reaction to a vaccine. Dose was too high for your metabolism and the amount of toxins you have in your body and you're in a detox. You don't have to follow the label directions. Some people are more sensitive to the effects of herbs and they don't need as high of a dose that's listed on the label to detox their body. You have a parasite and the herbs started to kill it. It is sometimes a difficult process to kill parasites, although the hard part is typically over with in a few days. Using high quality herbal products usually can sometimes result in healing reactions. Most people are not used to these reactions because most herbal products available are diluted and watered down so that no one has a reaction. Without healing reactions, it is difficult to heal. Herbal therapy cleanses metabolic and environmental wastes that have accumulated in the body for as long as 20 years. In order to heal, these wastes must come out. They do not magically disappear or spontaneously combust. These accumulated wastes have been hiding in fat cells, muscle cells, brain cells, in the liver, intestines and kidneys. Herbs stir up these toxins, releasing them into the bloodstream so that they can eventually be eliminated for good. During this time, symptoms from the past often appear temporarily as the body is cleansing away these toxins. After completion of an herbal cleanse, these reactions stop. A classic example is someone with arthritis who does a kidney cleanse and during the cleanse, joint pain feels worse. However, when the cleanse has been completed, the joints feel much better than before starting the cleanse. The healing effect tends to be long-lasting. Many people are very happy to go through a short period of discomfort to get their function back and to have the chance at a normal, healthy life. Each herbal order comes with a detailed information sheet describing how to minimize these healing reactions so that one can still function in daily activities while doing an herbal cleanse or taking any herbal formulas. I have plenty of clients who take herbs and do herbal cleanses while carrying on a normal work day. Most medical doctors do not understand herbal therapy or these healing reactions, and they frequently misdiagnose these reactions as allergic reactions. They prescribe medication to stop the reaction. When they do this, they stop the healing, and ruin the effect of the cleanse. In order to heal, one should not attempt to suppress the symptoms of a healing reaction. Allergic reactions to herbs are extremely rare. 99.9% of all the reactions I've ever seen to herbal products have not been allergic reactions at all, but healing reactions. The most common reason a detox reaction happens is because a person tried to skip steps and do an advanced cleanse or take a lot of herbal formulas without cleansing the colon first. If the colon is cleansed first, then detox reactions to other products are far milder and much less problematic. To flush out toxins from the body when they are being released into a colon already filled with toxins overloads the body's ability to eliminate the toxins. And a person will feel sick when this happens. It is a problem that is mostly avoidable if the colon is cleansed first. Therefore, always remember to start a healing first with colon cleansing. Click here to read more about the importance of colon cleansing. A typical detox reaction happens when a person takes large doses of herbs, has been feeling stronger and then....boom - they suddenly feel unwell. Depending on the person, this could take anywhere from a day of taking herbs up to the 2 or 3 month mark. The reaction usually only lasts a few days, but sometimes up to a week and the key factor here is that the person ALWAYS FEELS BETTER THAN THEY ORIGINALLY DID before they started taking herbs. Some kind of weight was lifted. A healing occurred. In the case of chronic headaches, the pain can feel worse during a liver cleanse, but after the cleanse is over, a person finds that they are not getting as many headaches as they used to. The headaches may not be entirely gone after just one cleanse, but the headaches do not occur as often as they used to and they are usually less painful they were before. A true allergic reaction causes symptoms, and when the symptoms finally subside, a person DOES NOT FEEL BETTER than they did before they were taking the herb/supplement. So, a reaction to a commercial vitamin/ supplement/ herb could actually be an allergic reaction to the petroleum base (even though these huge supplement corporations NEVER list these on their labels) or to the toxic heavy metal contaminants. And the best defense against these contaminants is to only order from companies who use only domestic herbs from America and who do not use synthetic vitamins. To get the best quality, look for "food-based supplements." Food-based supplements contain only foods and herbs. Every one of Dr. Foster's Essentials products is food-based and the ingredients come from organic farmers in North America. Even the alcohol base used in the formulas is certified organic. For more information about the problem with vitamin/ mineral/ herbal contamination, please click here to read the article "The Truth About Herbs." A lot of people are hung up on the dose they should take. They think they should take the same dose every day and they should follow exactly what's on the label. Wrong! HERBS ARE NOT MEDICATIONS. Herbs are foods. They are therapeutic foods. People need to be taking whatever dose feels right FOR THEM. They need to keep in mind their own individual metabolism, their age, their weight, their health level, and how they're feeling that day, and adjust their herbal doses accordingly. If they're having a healing reaction to a pure product, they need to cut down the dose of their formulas, even if it means cutting the dose down lower than what is recommended on the label. Maybe someone needs to take 5 drops instead of the 35 drops (one dropper full) that is recommended on the label. Maybe they need one teaspoon a day of a powder instead of two tablespoons. People are much more familiar with their bodies than doctors, naturopaths, herbalists or any other type of therapist. They simply need to recognize it and take on their own power. Pure herbs are simply not that dangerous. So lower a dose, raise a dose - it's not going to be life-threatening like a prescription medication could be. I want everyone to remember that HERBS ARE NOT THE SAME THING AS PRESCRIPTION MEDICATIONS. The only time I suggest pushing the edge with herbs and keeping doses high is in the case of a life-threatening disease, a bad infection or a bad case of parasites. In these situations, we may not have time to do the herbal healing slowly, and we may need to experience some healing reactions to get well. I feel a rush when I take Dr. Foster's Essentials herbs. Is this normal? Many of the formulas contain herbs that stimulate circulation such as Cayenne, Ginger, Garlic, Ginkgo or Turmeric. The increased circulation can feel like a "rush" to some people who notice an increase in warmth and flow of circulation through the body. Increasing the flow of circulation is a very important step towards healing the body. The increased circulation also helps better direct the herbs to the areas where they are needed. Circulation-enhancing herbs are sometimes called "facilitator" herbs for this reason. What do I eat during an herbal cleanse/program? Normally, there are three choices depending on how strong you want the cleanse to be. 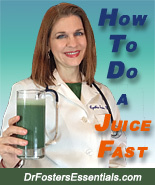 Juice fasting is always the strongest, fastest cleanse. After that, raw foods will give you a great cleanse. Milder than that is a cooked, plant-based diet that still works synergistically with a cleanse. A fourth choice which is not really recommended, but which people do anyway, is to keep eating what you've been eating, and you will probably still get some benefits from the cleanse. If diabetic, it is best not to juice fast, but follow option #2 below. 2. Raw plant food diet – excellent results. No cooked foods. Eat only fruits, vegetables, sprouted grains (sprouted barley, sprouted wheat, etc. ), sprouted beans (lentil sprouts, chickpea sprouts, mung bean sprouts, etc. ), sprouted veggies (onion sprouts, radish sprouts, broccoli sprouts, etc.) seed sprouts (sunflower sprouts, fenugreek sprouts), nuts (almonds, walnuts, pecans, pistachios, macadamia nuts, Brazil nuts, etc.) and seeds (sesame seeds, sunflower seeds, chia seeds). For optimal digestion, soak seeds or nuts in a bowl of water overnight (8-12 hrs.) before eating the next day. For example, salads (pile on the veggies) with olive oil and lemon juice, avocado, fruit smoothies (orange, apple or pineapple juice with any fruit), apple slices or other fruit with raw nut butter, raw carrots/cauliflower/broccoli/celery or other raw veggies with raw almond butter, fresh orange juice, plums, fresh pineapple, mango, dehydrated flax crackers with fresh raw salsa or fresh raw guacamole (no sour cream), raw coconut milk and flesh from Thai coconuts, raw beet borscht soup, raw cucumber soup, dehydrated veggies such as zucchini or eggplant slices. It is not recommended to consume a raw diet if you have colitis, a stomach or duodenal ulcer or Crohn's disease because it may further irritate ulcerated areas (use a cooked bland diet or juicing diet for these instead). 3. Plant food diet with raw and cooked foods – good results. No animal products: meat, chicken, turkey, fish, seafood, venison, pheasant, duck, eggs, dairy, milk, yogurt, cheese, pudding, butter, gelatin, jello, whey, dairy protein drinks, etc. Eat fruits, vegetables, beans, grains, nuts and seeds. (Couscous, hummus, tabouli, salads, tofu, veggie burgers, almond butter, etc.). Examples: hummus with whole wheat pita or other whole grain bread, tabouli, baba ganoush, eggplant with garlic sauce, stir-fry veggies with coconut milk curry sauce and brown rice, lentil soup, black bean soup, miso soup, vegetable soup, beans and brown rice, veggie burgers with tomato/lettuce/sprouts/mustard, tofu dogs on whole grain bun with mustard, baked potato with olive oil/sea salt/chives/sunflower seeds or salsa, couscous with veggies, whole grain veggie lasagne with soy cheese, soy yogurt, almond milk, rice milk, soy milk, tofu pudding, whole grain pasta with marinara sauce and veggies, baked zucchini slices, baked apples with dates and almonds and cinnamon, pumpkin seeds baked in tamari sauce, sweet potatoes with Grade B maple syrup and cinnamon, dairy-free granola with soy milk, oatmeal with rice milk, fresh cranberry sauce, wild rice or brown rice seasoned with veggie bouillon/seasoning and asparagus or other veggies, butternut squash soup, whole grain dairy-free crackers with olive tapenade, marinated baked tofu, green beans with slivered almonds, whole grain spaghetti with veggies and tomato sauce, baked summer squash, split pea soup, quinoa with veggies, baked banana with coconut and slivered almonds, baked millet, etc. What should you eat after the cleanse is over? My hope is that you'll avoid junk food, soda pop, fried foods, refined sugar, refined "enriched" flour, trans fats, hydrogenated oils, "vegetable oil", monosodium glutamate, irradiated spices, meat, milk or eggs that came from feedlots, animals that were fed antibiotics, GMO's, artificial colors and flavors, and tap water. Eat as many organic foods as possible. Try to eat some raw fresh foods every day. Drink at least half your body weight in pure filtered water. Should you be a vegetarian? Maybe. It's up to you. Try it and see if it works for you. If so, great. If not, then experiment and find a whole foods unprocessed, unrefined diet that works for you. The most common herb-drug interaction is that between the prescription blood thinning drug Warfarin (Coumadin®) and herbs that thin the blood such as Garlic, Onion, Red Clover, Ginger and Ginkgo biloba. (Contained in the Healthy Cholesterol Formula, Germ Blaster, Garlic Tincture, Ginger Tincture, Blood Detox Formula, Blood Purifying Herbal Tea, Brain Regain Formula, L/GB Formula) Anyone who is taking Warfarin (Coumadin®), Heparin, Enoxaparin (Lovanox®), Clopidogrel (Plavix®), Ticlopidine (Ticlid®), Apixaban (Eliquis®) or other prescription blood-thinning herbs should not attempt to take herbs because the risk is too high for bleeding. On the other hand, I have had some clients with very thick blood that even Coumadin® couldn't thin. When they took blood thinning herbs, they had no problems, since their blood was so thick to start with. Under these circumstances, it was ok, but this is obviously a very touchy area and extreme caution still applies to everyone who is taking prescription blood thinning medications. They should be supervised by a knowledgeable practitioner who can monitor their PT/PTT/INR levels if they want to attempt something like this. Because herbs can strongly affect physiology, the effect could be too strong if an herb that has a specific effect is taken with medications that also have the same effect. For example, one should not combine stimulating herbs (such as ma huang, coffee, or yohimbe) with a stimulant medication (such as Ritalin® or amphetamines). Yohimbe is contained in the Male Magnetism Formula. Generally speaking, one shouldn't combine prescription sedatives (such as benzodiazepines or barbiturates) with herbs that have sedative effects (valerian, passionflower, hops - such as contained in the Peaceful Nerves Formula). Although, I have combined herbal sedatives with anticonvulsants with people who had breakthrough seizures, and not only did the herbs stop their breakthrough seizures, but their bodies were so accustomed to the sedative effects of the anticonvulsants, the herbal sedatives didn't even cause drowsiness. (Dilantin stimulates the P450 enzyme system in the liver so that drugs and herbs are metabolized more quickly). One shouldn't combine hormone balancing herbs with prescription estrogen/progesterone medications such as birth control pills. Phytoestrogens and plant sterols (contained in Female Harmony, Femme Pause®, Female Magnetism, and Sweet Essence) may reduce the contraceptive effect of birth control pills. I have had women take herbs for menopause (Femme Pause® Formula) at the same time as their hormone replacement therapy. One should use caution in this area because there can be too much hormonal stimulation when using both. Women know when this has happened because they experience hot flashes again. They can lower their dose of herbs or hormonal replacement therapy to compensate and then they are fine. Or if they want to stop the hormone replacement therapy, they can gradually taper the medication while they start and gradually increase the dose of menopausal herbs. It usually takes about one month to do the taper. On the other hand, prostate herbs (saw palmetto) don't appear to interact with prostate medications and many men have combined my Prostate Formula with their prostate medication. Absorptive substances such as Charcoal and Psyllium as well as mucilaginous herbs such as slippery elm (contained in the Colon Detox Caps) can reduce absorption of medications as well as herbs, but only if taken in the same dose. One should allow 1 hour before or after taking the Colon Detox Caps to take medications or other herbs. Herbs that reduce blood pressure (Garlic, Linden flower, Hawthorne as contained in the Vascu-Calm Formula) should be used with caution in those who are taking blood pressure lowering medications. The reason is because the blood pressure can decrease too much, and this results in dizziness and heart palpitations due to low blood pressure. However, if one monitors the blood pressure regularly while taking these herbs, one will see the blood pressure coming down and decrease either the medication or the herbs before any symptoms of low blood pressure appear. There are some herbs that have similar effects to medications; however I highly discourage taking herbs like medications. In order to heal a particular complaint, it is necessary to heal the entire body, not just the part that has symptoms. We are not trying to suppress symptoms with herbs; we are trying to heal and regenerate the entire body so that the body can heal itself. Trying to suppress symptoms with herbs usually is as unsuccessful as using medication to suppress symptoms. This is because the body is a very complex organism and the functioning of one organ is usually tied to many others. The entire body is interconnected. We cannot have a problem in one organ without having problems in several others. One must ask what all the reasons are for the illness and address all possible causes, even if that means healing a remote area of the body that doesn't appear to be related to the illness. For example, in order to heal the heart, it is not only necessary to take herbs for the heart and circulation, but also herbs for the liver, the immune system, the intestines, exercising and perhaps using essential oils for emotional healing. Doing any less than this is cheating oneself out of a full healing and can cause chronic illnesses to drag out unnecessarily. Some herbs have a lighter color than others, and this can cause a cloudy appearance. It is completely normal and does not mean that the formula has spoiled. The following herbs appear cloudy when they are extracted: Garlic, Ginger, Turmeric, Horseradish, Daikon, Ginseng, and the Germ Blaster Formula. Even Cayenne tincture can look cloudy when habanero or other light-colored peppers are used. These herbs are in either an alcohol base or a vinegar base which means it is impossible for them to spoil. There is a tendency for the particles to settle to the bottom of the bottle. The particles for ginger, garlic and turmeric are so fine that they cannot be filtered out. (But this is good because we don't want to overfilter liquid extracts because then they lose potency). Some particles in the bottom of the bottle are good - they add potency to the herbs. The cloudy appearance intensifies when the bottle is shaken and the fine particles at the bottom of the bottle once again become suspended throughout the liquid. Each bottle may get a slightly different amount of particles in it depending on various factors such as how close to the end of the batch the bottle was filled (slightly more particles at the end of a batch than at the beginning). These are slight variations, and most people will not notice them. Because we leave in a bit of particles with the tinctures, you may sometimes notice that a little has collected around the neck of the bottle. This is a completely normal variation and is not an indication that the formula has gone bad. For these formulas (Garlic, Ginger, Germ Blaster), please make sure to shake the bottle thoroughly before each dose so that you don't end up with particles at the end of the bottle. It is a good idea to shake all liquid formulas before consuming them. Yes, this is normal. Each batch of herbs is slightly different from the last one. The amount of sunshine, rainfall, mineral density of the soil and many other factors come into play to determine the final appearance, taste and smell of an herb. We all know that every time a batch of wine is made, it is slightly different from the year before. People say, "That was a good year" about wines that taste good. These variations are a part of nature. It is not possible to make wine taste exactly the same year after year, batch after batch. However, there are 2 industries who have succeeded in making their products exactly the same year after year. The first one is the perfume industry. Instead of using natural essential oils that can vary in smell from batch to batch, they use synthetic fragrances. Synthetics always smell exactly the same. Perfume companies invest millions of dollars in synthetic fragrances in order to get a perfume that smells exactly the same from batch to batch. Each time you synthesize a chemical fragrance it smells exactly the same as it did the last time you made it. Of course, many people have allergies and multiple sensitivities to these synthetics, and I know a lot of people who can't wear perfume or even stand to be in the same room as someone who is wearing chemical perfume because of this, but that's another story. The other industry that succeeds in making its products exactly the same year after year is the pharmaceutical industry. Every time you take an brand name anti inflammatory, you're going to see a pill that is exactly the same size, has exactly the same color coating and exactly the same smell and taste. Of course, this is also done through chemistry. The pharmaceutical industry has endeavored to standardize every dose through synthetics. It worked. Now, everyone has come to expect their products to be exactly the same every time they buy them. But it's not natural. And unfortunately, we have also discovered that, unlike natural herbs, people have allergic reactions and side effects to these chemical products - liver damage, kidney damage, hearing loss, muscle damage, increased suicides, gout, arthritis, confusion, delirium, changes in vision, headaches, mood changes, anaphylactic shock, etc. And now there is a tendency toward standardizing herbs. Many herbal companies want to make herbs have exactly the same chemical constituents each batch. They want to triple filter, give it a pretty transparent color and make it taste good. It's not natural and it doesn't work very well. (But it looks pretty). Surprise, surprise, we're now finding that people are having negative reactions to these as well. Personally, I would prefer taste/smell and appearance variations over side effects and allergic reactions. I'm not interested in how "pretty" herbs look. I'm interested in how well they work. Most people take herbs because they need them - they are sick or they have a health problem. Taking something "pretty" is not the same thing as taking something that is "effective." I aim for effectiveness and not prettiness. Nature puts the right constituents in the right amounts for each batch. It understands and responds to our needs. Our needs are always changing. Nature is always changing. And between the two, somehow it all works out perfectly. How it happens, we don't know - that is the very beautiful mystery of God and Nature. The batch that tastes different may be exactly the batch that is needed to combat your breast cancer. The formula that doesn't taste as yummy as usual may be the one that dissolves your cyst, soothes your stomach ulcer or drains your sinuses. Sometimes our garlic grows with a greenish pigment inside and our garlic tincture turns out a little green. It's a normal variation that works just as well as the garlic without the greenish pigment. Do we throw it out because it's green? Heck no! Thank God it's green - Nature believes I should have greenish garlic this time around - and I believe her. I have found that the closer we are to nature and the more we flow with nature's variations, the more likely we are to heal. Be happy when Nature does something different, it is usually something good for us. Resin has collected around the neck of my bottle of Myrrh oil. Is this normal? The resin around the edges - that's normal for myrrh oil. Myrrh IS a resin, and the oil is a concentrated form of the resin. It is normally a thick oil. It hasn't gone bad. Myrrh oil can last many many years. When exposed to air, the resinous oil becomes sticky. We used to buy it in 15 ml bottles and by the time we got half way through the bottle, the top would become clogged. This is one of the reasons why we do not sell the 15 ml size - only the 10 ml size and diluted with jojoba oil. That way, the the myrrh oil doesn't dry out. Because myrrh is such a thick oil, it does not diffuse well, so we do not recommend putting myrrh oil in your diffuser as it will definitely clog the diffuser. 1. Use a tooth pick to reopen the opening of the orifice reducer (the plastic part that fits into the neck of the bottle). 3. If the lid is difficult to remove from the bottle, soak the bottle in hot water. 4. The remaining myrrh oil can be still be used, or if you want to thin it out, mix it with a carrier oil and keep it in the bottle of carrier oil. This will protect the oil from air and keep it from thickening. If you are using the oil for your face, we recommend mixing it with jojoba oil, as this oil is commonly used on the face and is easily absorbed into the skin. 5. Myrrh oil can also be mixed with any other essential oil. 6. Don't leave the lid off the bottle of straight myrrh oil for more than a few seconds - only open it just long enough to get a drop of oil out of the bottle and then put the lid back on. This will minimize exposure to air and prevent excess resin from collecting around the neck of the bottle. Even though it is sticky, it is still effective myrrh oil - it still works. We scrape off the hardened resin and keep using the myrrh in the bottle. This happens only with myrrh oil - Frankincense is a resinous oil as well, and a tiny bit of resin can collect around the neck, but it's usually so slight that it's not even noticeable. Can children and babies take herbs? Are they too young? Of course they can take herbs! Simply decrease the dose depending on the child's weight. Each herbal order comes with a mathematical formula to calculate the dose depending on a child's weight. The Colon Start Plus Formula is too strong for children (no exceptions) and the Vibrant Colon is too strong unless your child weighs over 100 pounds. The Colon Cleanse Syrup is mild and specifically designed for children. If a child or infant has a severe health issue, it is better to take herbs than not to try. Many children have been healed quickly since their metabolism is so responsive to herbs, and they are typically emotionally more ready to heal than adults. Why are the tinctures preserved in alcohol? What can I do if I'm sensitive to alcohol? Tincturing the herbs in alcohol accomplishes many important functions. For one, alcohol is a natural antiseptic. If there are any germs on the herbs, after they have been tinctured, none remain. Secondly, alcohol is a wonderful natural preservative. This gives the herbal tinctures an almost indefinite shelf life. One can use an herbal tincture decades after its manufacture, and it still works. Powdered herbs can begin to lose potency after a few years. Liquid formulas that do not contain enough alcohol can spoil quickly. There is nothing worse than a spoiled formula (I've seen it happen), since they are no longer safe to take and they smell absolutely horrible! We keep a certain percentage of alcohol in our formulas to guarantee that spoilage does not happen. We've never seen one of our alcohol-based formulas spoil. A third reason is because the alcohol allows us to concentrate the herbal product to a high potency. Using alcohol as the base brings out more therapeutic qualities from medicinal herbs than any other substance. For example, alcohol can dissolve and extract therapeutic plant lipids, whereas water (as in the case of an herbal tea) cannot. Because their potency is many times higher than powdered or encapsulated herbs or herbal teas, we can often achieve a healing very rapidly when compared to traditional herbal therapy. Our herb to alcohol ratio is 1:1. This means 1 part herbs to 1 part alcohol (this means half the container is filled with herbs and the other half with alcohol). This is almost unheard of in the herbal industry! The National Formulary recommends a 1:4 ratio (1 part herb and 4 times the amount of alcohol as a standard for the herbal industry), 1 to 5 or even a 1 to 10 ratio! A 1:10 ratio means you have ten times the amount of alcohol in your formula as herbs - a weak, weak, weak formula that hardly helps at all! According to the standards set by the National Formulary (followed by most herbal companies), our herbs are four times stronger. Quickest absorption of all herbal preparations taken by mouth. Alcohol is one of the few substances on earth that can be absorbed directly from the stomach. Foods, and most other substances must go through digestion in the stomach and pass into the duodenum (small intestines) before being absorbed into the bloodstream. This means that an alcohol-based formula can act very quickly, and in the case of an emergency, can be absolutely life-saving. Glycerine bases contain a significant amount of sugar, can be inappropriate for diabetics/ hypoglycemics and do not extract as many therapeutic components as an alcohol base. We do use pure vegetable glycerine in a few formulas mainly just for children's formulas since many times it seems that the sweet taste is the only way we're going to get them to take bitter-tasting herbs. Finally, a liquid holds specific healing frequencies better than a powdered formula. Most of our liquid formulas have been enhanced with specific healing vibrations that are known to stimulate healing and repair. Most of our customers have noticed that there is something truly unique and powerful about our liquid formulas. Most of our essential oils are undiluted and many of them must be diluted before applying to the skin, especially cinnamon oil, oregano oil, lemongrass, thyme, ginger, black pepper, or any blends that contain these. If used undiluted, some essential oils can cause some skin irritation. However, some people will find that their skin is not so sensitive (especially the bottoms of the feet) and they can apply some or most essential oils without diluting with a carrier oil. Some of our essential oils have been pre-diluted with jojoba oil so that they can be used in the nose or on mucous membranes straight out of the bottle. These do not need to be diluted further. They include Herp-Ez, Germ Shield, Migra-Stop and Grounding. You will notice Jojoba oil in the list of ingredients for these formulas, and this is how to know these are pre-diluted. What Herbs Can I Take/Should I Not Take During Pregnancy? Strong Laxatives: Colon Starter Plus, Vibrant Colon, Colon Activator, Aloe vera, butternut, purging buckthorn, buckthorn, cascara sagrada, Turkish rhubarb, and senna. During the 3rd trimester, laxatives (synthetic or herbal) may bring on premature labor in women who are in the third trimester of pregnancy. Safe alternative during 3rd trimester: Flora-G Plus. Herbs Containing Volatile oils: Juniper, pennyroyal, nutmeg in large amounts, Thuja, Kidney/Bladder Formula, Kidney/Bladder Herbal Tea. However, I have used kidney/bladder herbs in pregnant women who were at risk for miscarriage due to UTI, and it saved the baby. Pennyroyal is never recommended during pregnancy and I do not recommend essential oils of thuja or juniper. Herbs Containing Alkaloids: ipecac, autumn crocus, Scotch broom, lobelia, mayapple, bloodroot. However, lobelia has been used successfully to stop threatened miscarriage, especially when combined with cramp bark. Bitters: Aloe vera, wormwood, southernwood, barberry, celandine, goldenseal, rue, feverfew, tansy, L/GB Formula, Anti-Par Formula, Eyebright Formula (the goldenseal can stimulate the uterus during pregnancy), Blood Detox Formula. Bitter herbs, in general, are not recommended during pregnancy. However, I have used many of them without harm to pregnant women when it was necessary to save their life. Other herbs: Poke root, Mandrake, Pennyroyal, Rue, Tansy – without exception, pennyroyal and rue should never be used during pregnancy. Can I take herbs while I'm breastfeeding my baby? If you are taking superfoods, tonic herbs or probiotics, the answer is a resounding yes! Some of the nutrition and benefits of the herbs can go through the breastmilk and help the baby. There is also an herbal tea that can help increase breastmilk. (Lactation Tea) There is an official herbal program I recommend for women who are breastfeeding (the Postnatal Program) that helps them to recover from childbirth and to maximize their nutrition for breastfeeding, but there are many other tonic herbs and nutritional supplements they could take, such as Adrenal Support, Immune Valor, Calcium From Herbs, Iron From Herbs, Digestive Formula, Essential Nutrients, Earth's Nutrition, Eyebright Formula, Female Harmony, Ginger Tincture, Healthy Skin, Milk Thistle Tincture, Tissue Repair Oil, and most essential oils. They can also take probiotics such as Flora-G Plus, Flora-G Lozenge, and Candida-G. Digestive enzymes (Digest Factor) and a few capsules of Colon Detox Caps per day are also OK. If the infant has an illness, these herbs received through breastfeeding can be enormously beneficial. Echinacea Premium, Berberine Power and other anti-infection herbs can be taken this way to benefit the baby. For a breastfeeding woman who wants to do a "detox," it is usually best to wait until after the child has been weaned from nursing before attempting an herbal detoxification (liver cleanse, kidney cleanse, blood cleanse, juice fasting). However, in certain circumstances, some breastfeeding women may not be able to wait due to their own ill health. In this case, it is possible to do a cleanse without breastfeeding by storing up extra milk using a breast pump. Then during a cleanse, instead of breastfeeding the baby, feed the baby the stored breastmilk. Laxative herbs can have a laxative effect on the baby, so it's important to watch the dose of these herbs when breastfeeding, since too much can cause babies to get diarrhea. This includes the Vibrant Colon Formula, Colon Activator Formula and Colon Start Plus Formula. We've had women who breastfed their baby only a couple of times per day, taking the Colon Starter Plus Formula, an extra strength formula, and because the amount of herbs that went through the breastmilk was so small, it did not have an effect on the baby. Absolutely, and it's very natural and instinctual for them to do this on their own! Most of our knowledge of herbs originally comes from watching which herbs animals consume when they are ill. When in the wild, animals naturally forage around for herbs, especially when they are sick. The herbs help them recover. To give your pet herbs, simply adjust the dosage according to the pet's weight (the instructions are provided with each herbal order). Pets respond particularly well to Essential Nutrients, the AntiParasite Formula, The Earth's Nutrition Formula, and can even drink carrot or other fresh vegetable juices. Many pet owners have told us their pet had tumors that shrank when they gave the Blood Detox Formula. I've even known some owners to get their pets to take garlic cloves or Garlic Tincture and Cayenne with good results. There is one exception: be careful not to overdo it on the Echinacea with cats. In large enough doses, it can cause some intense foaming at the mouth. Is my teenager with a hormonal imbalance too young to take herbs to regulate her menstrual cycle? Absolutely not! Herbs can be taken at any age to help restore balance to the endocrine glands. If she doesn't take herbs to balance the hormones, medical doctors will put her on birth control pills anyway. Birth control pills can cause liver damage, liver tumors, increased yeast infections, breast pain, mood swings, aggravation of migraines, weight gain, water retention, vitamin deficiency, loss of the menstrual period, abnormal thickening of the blood and increased risk of stroke and heart attack. Unlike birth control pills, herbs have none of these side effects, and as an added bonus, tend to help restore emotional balance as well. The formula for teenagers is the Female Harmony Formula. Most people begin with a basic herbal cleansing program. (See the "Where do I Begin?" page) Each cleanse contains information on signs and symptoms of toxicity that alert one to problems with liver, kidneys or intestines. In some cases, one may need certain herbs for specific health issues in addition to a basic herbal cleanse. For example, a person with memory loss should begin with an intestinal cleansing routine then move up to a liver cleansing routine. In addition, brain herbs are also helpful such as the Brain Regain Formula, Cayenne, and Frankincense essential oil. Do the search under organ systems to find the herbs that are specific for a particular health issue. The online shopping cart is designed by organ system so that one can find the herbs needed for the brain, immune system, heart, eyes, skin, female issues, etc. Also check the articles for any additional information on particular health problems. In my personal and clinical experience with herbs, I have found that vitamins simply do not work as well as high quality herbs. In my opinion, most vitamins are a waste of time, money and kitchen counter space. Most contain synthetic chemicals that are indigestible. I have had many clients come to me with an entire shopping bag full of vitamins that didn't work. These were highly expensive, supposedly high quality vitamins with special processing to make them more absorbable. Considering that most B vitamins have coal tar as their base, I wouldn't want to make them more absorbable. Even though many vitamin manufacturers claim to sell the "natural" form of the vitamin, the proof is on the label. If the ingredients listed are vitamins, but not food, this means that the vitamins are synthetic - even if the label says it's "natural." What is the shelflife of herbal supplements? 99% of our liquid formulas are preserved in a base that is either certified organic pharmaceutical grade alcohol or organic raw unfiltered apple cider vinegar. Vinegar, by definition, is already fermented. It cannot spoil or go bad. Alcohol is a strong natural preservative in the right concentration. Our tinctures are made with just the right percentage of alcohol (90 proof) to extract the maximum amount of phytonutrients as well as to preserve the formulas pretty much indefinitely. Our formulas are also bottled in dark amber glass bottles, which means these liquid formulas can retain their potency for many years after purchase. These formulas are great not just for everyday use, but can also be included in emergency first aid kits, and for long-term food storage/ natural disaster preparation kits. Our syrups (Colon Cleanse Syrup, Immune Boost Syrup, Herbal Cough Syrup), on the other hand, contain a lower percentage of alcohol and contain either organic maple syrup, honey or vegetable glycerine. Although these natural sweeteners are also natural preservatives, they are not as strong as alcohol. Therefore, their expiration dates should be followed, and for extra safekeeping, they should be refrigerated after they've been opened. Any encapsulated formula, if not taken, typically keeps its potency for around 3 years (and longer if the seal has not been broken). A powdered formula such as the Essential Nutrients, Colon Soothe, and Earth's Nutrition Powder should retain potency for around two years, and longer if its seal has never been broken. Any herbal tea, if sealed, should keep its potency for around three years. If the herbal tea is not in a resealable bag, one can place the original bag (with the herbs inside) into a ziplock bag and store in a cabinet away from heat and light. Essential oils can last for many years. After just a few weeks, their smell can change and mellow; however, they can retain full potency for around 5 to 6 years. But please remember one thing: even though they can last for a long time, herbs only work if you take them. So if you have them - take them! Stop putting it off until you have more time. Make more time - just a little more time is all it takes. Herbs don't get into your body by wishful thinking. They only get in if you put them in, or, in the case of essential oils, put them on! Liquid herbal extracts with an alcohol base do not need to be refrigerated. Syrups, such as the Colon Cleanse Syrup should be refrigerated after opening. Essential Oils do not need to be refrigerated. Floral waters (Rose hydrosol and Geranium Hydrosol) are more perishable than essential oils and ideally should be refrigerated. So, for example, Geranium Hydrosol (in the big 4 oz. spray bottle) should be refrigerated but the Geranium essential oil (in the tiny 10 ml bottle) doesn't need to be. Most of our formulas are in dark, opaque containers that protect the herbs against light and oxidation. Because of this they do not need to be stored in a dark cabinet. But they should probably be kept away from any heat source such as a furnace, heater, fireplace, stove or windowsill where there is direct sunlight throughout the day. Refrigeration won't hurt, so if there's a preference and there is room in the refrigerator, then by all means, refrigerate your herbs. Herbal extracts are fine if they are exposed to cold or freezing temperatures, but it's best to keep them away from high heat temperatures. The post office and ground delivery companies do a great job of keeping packages out of direct sunlight and heat. But if it's in the middle of summer, some people worry about a package being left on their front porch all day long before they get home from work. If this is a concern, please have us ship to a business address instead of your home address. How long will each bottle of herbs last?/ How many doses are in a bottle? This is highly variable depending on dose and frequency of use. A 2 oz. liquid formula on average lasts about 2 weeks if taken at the dose of 2 droppers full 3 - 4 times daily. It will last around one month if taken at the dose of 1 dropper full 3 times daily. Please read dosage recommendations on each bottle. Essential Nutrients/ Earth's Nutrition Powder lasts for around 1 month if taken at the suggested dose of 2 Tablespoons daily. It will last 2 weeks if taken at double dose. Vibrant Colon, Colon Start Plus, Colon Activator will last around one month if taken at the average dose of 3 capsules daily. Colon Detox Caps, if taken at the average dose of 12 capsules per day will last 22 days, or around 3 weeks. It will last 18 days if 15 capsules per day are taken. For smaller doses (such as 4 capsules per day), this formula will last around 2 months. One bag of herbal tea typically lasts anywhere from one to two weeks if 6 cups are taken daily, depending on whether or not the herbs are reused per instructions. Stone Dissolve Tea is meant to be used for 2 Three-Day routines for a total of 6 days. Stone Buster Tincture should be used up completely at the end of 4 days. Essential Oil use is highly variable, but I usually find a bottle lasts around a couple months if used daily. Digest Factor will last for one month if the recommended 1 capsule dose is taken 3 times daily. Flora-G Plus will last for one month if taken at the dose of 4 caps daily. For maintenance, it is suggested to do a cleanse every 3 months. For people who have done one cleanse and are not well yet, they can do more cleanses. Generally, it depends on how a person is feeling. If feeling strong, one can do two cleanses in a row, and sometimes even 4 cleanses in a row to really get to the root of a tough issue, and then go to a maintenance of one cleanse per 3 months. People who have cancer or other severe health issues often need to do the 28-Day Healing Program at least once, but they can repeat it several times if their problem is life-threatening. (Usually after the first month, they are out of danger.) However, some people may feel a little weak or tired after a basic cleanse and they may need to wait a week or two before attempting their next cleanse. It should never feel like the cleanse is so powerful, it has you on the floor - weak and defeated, but it should feel like you are pushing the edge a little bit. Is that Reiki Tummo Testimonial real? I didn't think I would ever have to write about this, yet questions about Reiki Tummo have continued to pour in. Most of the people asking these questions want to know if I really wrote this testimonial. Yes I did. I did receive a lot of help from the 1st three attunements. After the 1st 3 attunements, I did not receive any further benefit. The decision to have these attunements are an individual decision and depends on the individual case. I have also discovered other therapies that were also quite useful for me such as Taoist acupuncture, qi gong therapy, release techniques, moderate walking and emotional clearing techniques. You can ask questions about Kundalini Syndrome on the Discussion Board. Click the button on any page that says, "Ask Dr. Foster" or Click Here. Anyone struggling with this issue needs to realize that this is a lifelong path of releasing blocks and not to expect any one technique to solve everything. The rewards are great once you figure out your spiritual blocks. "A Winner Never Quits and A Quitter Never Wins"